Six civilians, including four women, were killed today when Syrian forces entered the northwestern city of Baniyas today. The attack came hours after the United States, reacting to the death of 27 protesters yesterday, threatened to take new steps against the Syrian authorities. 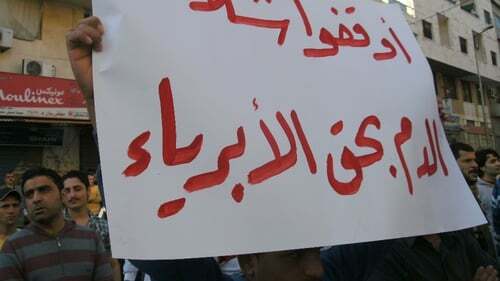 Baniyas has seen some of the most persistent demonstrations since unrest first erupted in the southern city of Deraa seven weeks ago, with activists calling for political freedom and an end to corruption. Army units with tanks entered Baniyas, a Mediterranean coastal city of 50,000 people, from several directions, advancing into Sunni districts but not Alawite neighbourhoods, the human rights campaigners said. Baniyas is around 70% Sunni Muslim and 30% Alawite. Most phone and internet communication with Baniyas has been cut but the campaigners said they were able to contact several residents. Sawasiah said the authorities had intensified a clampdown on communication networks to disrupt the flow of information about their ‘bloody repression of non-violent demonstrators’.